BBC One - The One Show - The One Show launches nationwide dog food questionnaire. The One Show has launched a nationwide questionnaire into our dogs’ diets. With veganism and vegetarianism on the rise, we want to find out whether this meat-free trend if filtering down to the nation’s pooches as well! We’ve found owners who have taken widely different approaches to their pets’ diets. To see if this is a nationwide issue we’ve launched The One Show Dog Food Questionnaire. 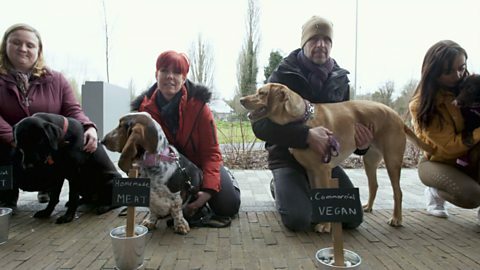 We’re asking dog owners throughout the UK how do you feed your dog, and a little bit about why they are making those choices. If you are a dog owner and this has given you some paws for thought then please get involved by filling out this short questionnaire.